These large size batteries are big, heavy (some easily over 100 pounds) and just plain hard to deal with. Let Discount Battery handle them for you or your company. 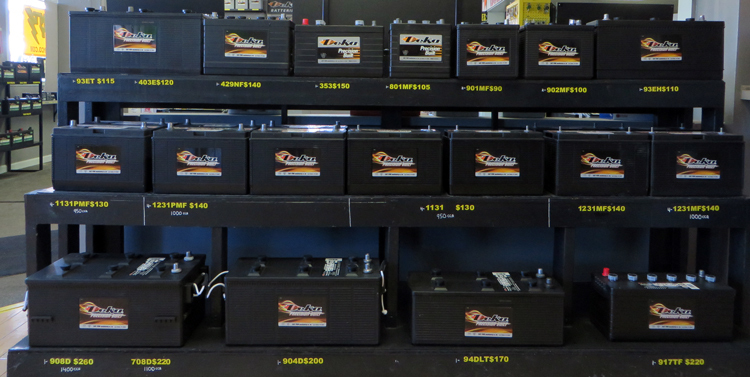 We carry a full line of commercial and heavy duty batteries and we will do all of the heavy lifting. Most of our batteries have handles. Deka, Interstate and Crown batteries all do a fine job making these types of batteries for heavy equipment and commercial use. We stock all of these sizes for the big machines. CCA (Cold Cranking Amps) is the number of amps the battery will supply for 30 seconds at zero degrees before its voltage drop too low. MCA (Marine Cranking Amps) is essentially the same as CCA except in this case it refers to the number of amps the battery will supply for 30 seconds at 32 degrees before the voltage drops too low to use. RC (Reserve Capacity) is the number of minutes a battery will last under a 25 amp draw (higher rating in minutes = longer the battery will last). This rating is a better measurement for the capacity of a deep cycle battery. AH (Amp Hours) rating is how much amperage is available when discharged over a 20-hour period (higher amp hour = the longer the battery will last).